When asked if Donald Trump or Democrats in Congress will have the better approach to a range of specific issues – or whether there’s not much difference between the two – the public prefers the approach of Democrats in many areas. For example, 55% of the public says Democrats will have a better approach to the environment, while 19% think Trump’s approach will be better. A quarter says there won’t be much difference between the two. 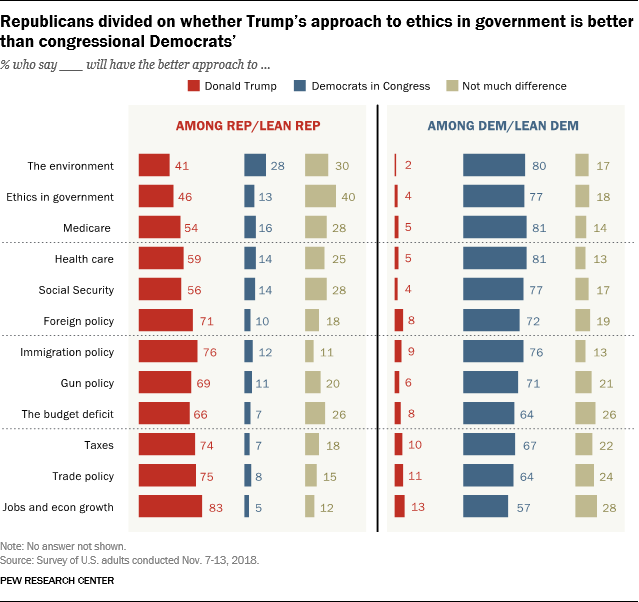 On ethics in government, about half (48%) say Democrats will have a better approach, compared with just 22% who say Trump will have a better approach. Nearly three-in-ten (29%) say there’s not much difference between the respective approaches. The pattern of opinion is similar in attitudes toward Medicare, health care, and Social Security, with pluralities favoring the approach of Democrats over Trump. When asked about immigration policy, 46% say the Democrats in Congress have the better approach, compared with 40% who say Trump has the better approach. A relatively smaller share (13%) says there’s not much difference between the two. Neither Trump nor Democrats in Congress receive a plurality of support for their approach toward the budget deficit – 34% say Trump’s approach will be better, 38% say Democrats’ approach will be better, and 27% say there will not be much difference. The pattern is similar in Americans’ views of taxes and trade. Jobs and economic growth is the one area where more Americans prefer Trump’s approach to that of Democrats (44% to 33%). Still, 22% say there’s not much difference between the two. While Republicans and Democrats generally prefer the approach of actors from their own political party, there are some issues for which in-party support is more modest than others. About eight-in-ten Republicans and Republican leaners (83%) say Trump will have the better approach to jobs and economic growth, while 5% say Democrats’ approach will be better and 12% say neither approach will be better. Large shares of Republicans also prefer Trump’s approach to immigration, taxes, trade policy, foreign policy and gun policy. However, when Republicans are asked who will have the better approach to ethics in government, fewer than half (46%) say Trump. About one-in-ten (13%) say Democrats will have the better approach, while fully 40% of Republicans say there will be no difference between the two. And on the environment, just 41% of Republicans think Trump will have a better approach than Democrats. About three-in-ten (28%) think Democrats will have a better approach and another 30% say there won’t be much difference between the two. Majorities of Democrats and Democratic leaners prefer the approach of congressional Democrats across all 12 issues included in the survey. However, the size of this majority opinion does vary by issue. On health care (81%), the environment (80%) and ethics in government (77%) large shares of Democrats say Democrats in Congress will have a better approach than Trump. When it comes to jobs and economic growth, Democrats are somewhat less confident that Democrats in congress have the better approach: 57% say this, while 13% say Trump will have the better approach and nearly three-in-ten (28%) say neither approach is better than the other.